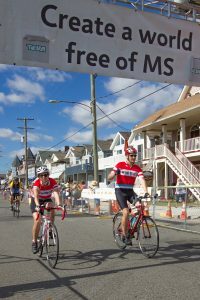 Everyone has a unique story about the start of their journey toward participating in a BikeMS ride. For me, it’s a short and random one that started in March, when I applied for a position at SWISCO.com, the small replacement hardware company. SWISCO happened to sponsor a charity cycling team. Despite the lack of biking experience on my resume, I soon found myself with a new job and a new hobby. By April, they lightly twisted my arm to join their team for the City to Shore ride; not a difficult task, as I am known to sometimes sign up for endurance challenges without training. By May, they nudged me into the position of team captain. Again, very little convincing was needed for me, someone who enjoys email chains, excessive organization, and opportunities to border on being bossy. By June, I figured it was time to hop on a bike and give the cycling thing a spin for the first time. And since then, I’ve been baby-stepping toward the finish line of the seventy-five mile BikeMS City to Shore ride on September 29th. 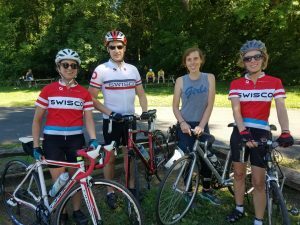 Four riders from Team SWISCO at a practice ride. Over this short journey, what stuck out to me most has been the fervently supportive community formed by my team and the National MS Society. As someone that’s active in similar communities, like yoga and running, I’ve got to hand it to cyclists for the amount of support they offer new riders. Maybe I’ve lucked out with a good group, but either way, they’ve taught me a lot of valuable lessons that are worth sharing with other new riders. So, if you’re just starting out long distance cycling or you are considering a Bike MS ride, I hope to share a few things I’ve picked up and push you toward trying a charity ride. My co-worker and fellow teammate, Steve, is quite the seasoned cyclist, with well-rehearsed adages like this tip. They may be obvious to experienced riders, but they are not as obvious to people who are just starting out, like me. Thirsty cyclists try to power through a ride. What Steve is hammering home here is that staying on top of your hydration before during and after your ride makes a huge difference. Try to take a sip as often as possible! As for the second half of Steve’s wise words: never pedal harder than you need to, in order to conserve your energy. 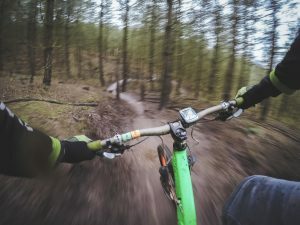 For a longer ride like City to Shore, conserving energy really matters, and anticipating gear switches for hills and stops makes a big difference. There’s no guilt in guilting your family and friends for money. This tip, I picked up from the top fundraisers on Team SWISCO. There really is no shame in using all of your resources to fundraise for the National MS Society. Exhaust your resources and reach out to the most remote corners of your social circle. Even if it’s just a few dollars from a co-worker or distant cousin, it adds to the pot for a really important cause. It can surprise you how much support you’ll receive from friends and acquaintances, but you won’t know until you ask. The MS Society is really, really nice and really, really supportive. SWISCO riders on the day of the BikeMS ride. Learning to navigate the team captain role as a rookie sounds like it should be intimidating, but I really never had a moment where I felt too overwhelmed. Again, this is wholly due to the support of my team and the resources provided by the MS Society. Upon becoming captain, I was assigned an MS Society contact who has guided me over every hurdle I’ve faced. 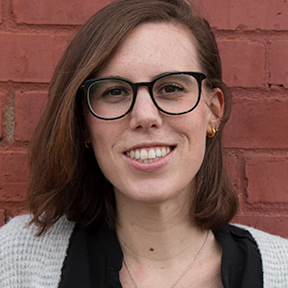 Team SWISCO’s contact, Melanie, checks in by phone or email every week or so to give updates on events, offer a little fundraising advice, and ask for general updates on how the team is doing. Any time I have a question, I know I can reach out for truly useful help (from a real person), and they’re excited to help! Everyone from the MS Society that I’ve met has been passionate about their cause and excited to pass along motivation and tips to me as a rookie and captain. Things will go wrong- flat tires, crashes/spills/falls, chain issues, etc. Seasoned cyclists love to tell you all about how these will all eventually happen to you. At first, I took this as a preachy exaggeration—a scary bedtime story for cyclists—until most of these things actually did happen to me within the first month. As an adult person with a fairly decent track record of keeping myself in one piece, I couldn’t understand how so many accidents could happen, but somehow, they really do just happen—usually at the most inconvenient times, too. I’ve learned from experience that the key to weathering bike problems is staying prepared and staying calm. Biking down a winding forest path. When Plan A ends with a crash and burn, always make sure you have a solid Plan B. Stay prepared by carrying your phone, some spare cash, and definitely a replacement tube and air. And if you ever see another cyclist in need of some help, help them! You’ll need the good karma later. During my first real practice ride, my teammates were always a step ahead of every pitfall we encountered over our 50-mile ride. Whether it was a bumpy stretch of concrete, a sharp turn, or even an area with a funky smell, they were sure to call it out. At first, this was outright strange to me, but eventually, you’re bound to start thinking this way, too. It’s good practice to stay aware of your surroundings and call out hazards. And when you often ride the same routes, those hazards are bound to stick in your mind. Without knowing exactly what to expect for the day or the ride, I’m sure that it is an understatement to say that the BikeMS route will be congested, so staying hyper-aware of your surroundings wouldn’t be a bad thing to keep in mind. Choose to bike whenever possible. Team SWISCO at a team huddle. This one may not seem like a direct training tip, but nonetheless, it’s a good one for anyone to practice. As someone that tries to stay aware of my carbon footprint, my short cycling journey has helped me to become more conscious of how I get around town. If I’m only going a few miles, I choose to hop on my bike rather than driving. Getting a little extra cardio training in while feeling better about that footprint is really a win-win. Race day is not the day to try out your new gear. For new riders, there’s a small initial investment: buying essentials like gloves, a helmet, bike shorts, and even a bike. My team started helping me compile my list early on and has forced me to put everything to use. A few weeks ago, I put my gear to the test by signing up for a triathlon sprint (see “signing up for endurance challenges without training”). During the seventeen mile biking portion, I started to get some pain in my shoulders. At that point, I made a mental note that my handle bars could probably use some adjusting before the big ride. Don’t put yourself in a position to find issues on race day when it’s already too late. You need to make sure everything about your bike is as comfortable as possible during a six hour ride.